Based on novel "Hansamu★Sutsu" by Osamu Suzuki (published January 25, 2008 by Shueisha). Lord Kikuchiyo Jan 18 2019 2:36 am There are permanent 'handsome suit' that we called plastic surgery though. But it still come with the same big question, do we really happy if we're bit good-looking? I agree with a comment by @some dude below, you gotta work for it if you want something. Sure being kind isn't enough to win someone and being JUST handsome or beautiful won't do the all the work either. Clarkdale44 Apr 06 2014 11:29 pm Well, the concept was really heartwarming but the same doesn't happen in reality. No body will ever look at you how no matter how kind and skilled you are unless you are cute or handsome. Yeah we really need suits like these to solve this problem. All the casts performed great. It was nice movie with sweet and storyline. My problem with the movie is that the ending is a complete cop-out. Takuro settles for the unattractive Motoe and *still* gets the beautiful Hiroko. There is no realistic reason for Hiroko to be interested in Takuro; he is fat, relatively ugly, about fifteen years her senior, dresses poorly, lacks confidence, has questionable personal hygiene and isn't even financially successul or famous or anything. Sure he's a nice guy, but that just isn't enough. Takuro *could* go to the gym and dress better and improve his self-esteem and so on, but he does not do so. In Movie Land, he just has to wait for the woman of his dreams to walk through the door and fall in love with him. In reality, if you want to get the pretty and nice girl you need to do some actual work. Javier Jun 19 2009 4:23 pm On may I recently watched this movie in Japan Airlines. Fully recommended for all! It´s a very enjoyable script and a rich actors cast. Congrats to the producers! tan Apr 09 2009 5:05 am personally, i didnt like it. maybe i am still under a young audience group or wad. but i tot the story was too dry and slow-paced. the plot seemed cliche enough too. the jokes are probably not a young girl's idea of humour. WikiSysop Mar 20 2009 8:37 pm Did you like it Jimmy? Jimmy Two Shoes Mar 20 2009 8:36 pm This movie is about an ugly looking Plump Japanese Chef who always picks his nose and the Woman whom he likes always rejects hims. RamenLover Dec 03 2008 10:56 pm Looking forwards to seeing this myself! K Dec 03 2008 8:58 am I watched this movie on the plane on Dec 1st and it was really funny! 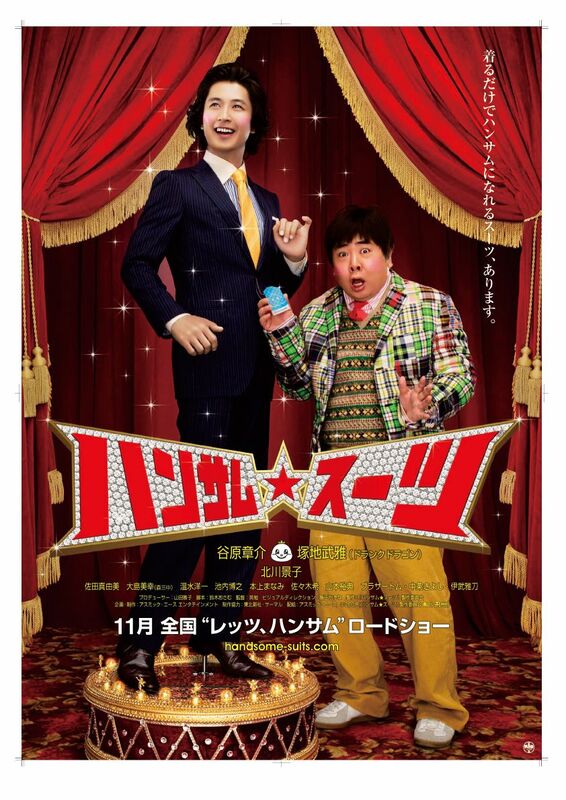 I recommend for people to watch this movie, especially if you want to laugh! One of my favorite quotes must be, 「ハンサム、しつれいします」 or "Sorry for being so handsome!" Corny? Maybe a little but definitely fun throughout.